Hello everybody and welcome back to Everything Hamradio! Today we are going to continue our series on the Technician Class License Question Pool! Today we will be talking about Diagrams. T6C01Â What is the name for standardized representations of components in an electrical wiring diagram? Each component in a circuit has a standardize symbol. These symbols have been standardized so that anyone looking at the circuit will know what they are looking at. If you were to look at someone else’s circuit diagram and they used something other than the standardize symbols, you wouldnâ€™t know what each component was so you couldnâ€™t make the circuit. T6C12Â What do the symbols on an electrical circuit schematic diagram represent? Each symbol on a circuit diagram represents a component of the circuit. For example, the first symbol is for a resistor the second is a few different capacitors. T6C13Â Which of the following is accurately represented in electrical circuit schematic diagrams? When you are building a circuit from a schematic diagram, you can make it as small or as big as you want to. You can make it into an Integrated Circuit(IC) Chip, or in a huge cabinet box. With that being said, the lengths of the wire would vary depending on how big you made your circuit, or you might not have any wires at all. While some of the symbols somewhat appear to be similar in appearance, some of them look nothing like the schematic symbol. So the only possible answer left is The way components are interconnected. T6C10Â What is component 3 in figure T3? Component 3 is a Variable Inductor. What makes it a variable inductor over just a regular inductor is the arrow that points back to itself. T6C11Â What is component 4 in figure T3? Component 4 is an Antenna! It kind of reminded me of what I had to use on my TV 25 years ago when my rabbit ear antenna broke. A metal coat hanger, with the hook part bent straight and stuck in the antenna spot on top of the TV. T6D08Â Which of the following is used together with an inductor to make a tuned circuit? Inside a tuned circuit, your will find series and parallel coils, or inductors, and capacitors. T6D11Â What is a simple resonant or tuned circuit? A resonant or tuned circuit must contain at least one inductor and one capacitor. More often than not you will find more than just one of each. The resonant frequency of the tuned circuit is the frequency at which the inductive reactance and the capacitive reactance are equal. A tuned circuit is one of the most important parts of a new radio because a resonant circuit of one form or another determines the frequency of operation. T6C02Â What is component 1 in figure T1? Component 1 is a Resistor. Think of the picture like this. If you were running down a hallway and the hallway turned in a zig-zag pattern like the symbol shows, would you have to slow down to make the turns. Yes! There fore it is resisting your speed of running down the hallway. A resistor does the same thing in a circuit. A resistor will slow down the current flow and decrease the voltage of a circuit. T6C03Â What is component 2 in figure T1? Component 2 is a Transistor, more specifically it is a NPN transistor. There are two types of Bipolar Junction Transistor(BJT), a PNP and an NPN. The most common type used, I believe, is a NPN type. If you look at the diagram symbol of each, you can tell which one is which by the way the arrow points on it. If the arrow is pointing out, it is a NPN transistor by remembering “Not Pointing iN”. There is a saying that I learned in college for the PNP one as well, but for the life of me I can’t remember it. T6D10Â What is the function of component 2 in Figure T1? A transistor is used for two purposes, to amplify a signal or to switch a signal. In this diagram it is used as a switch to control the flow of current. T6C04Â What is component 3 in figure T1? Component 3 is a Lamp. Now-a-days, LED’s are probably used more often then lamps, but they still have their uses. T6C05Â What is component 4 in figure T1? In any circuit, you have to have some kind of power source, whether that is a Battery or a power supply. The Battery provides the voltage to run the circuit. 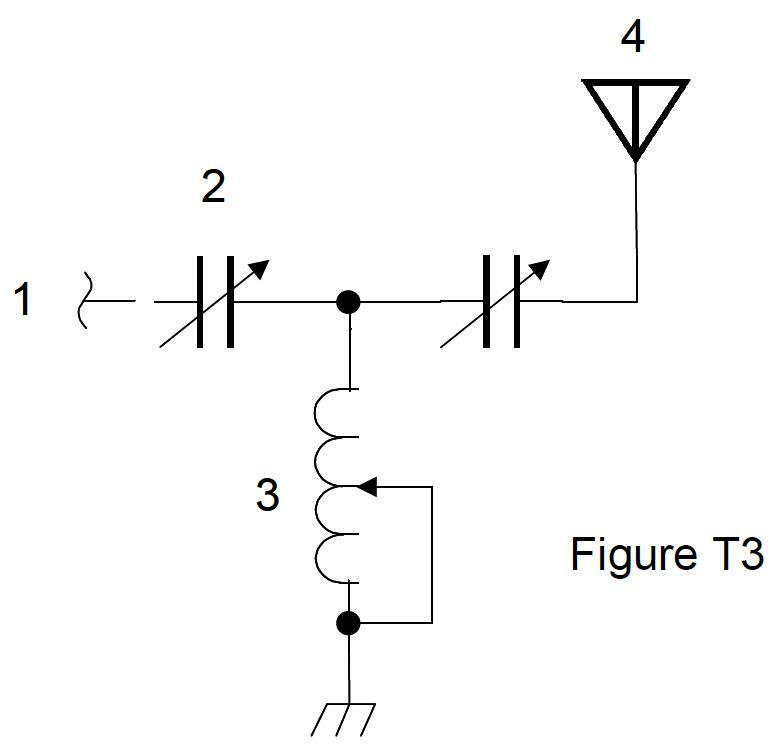 T6D03Â What type of switch is represented by component 3 in figure T2? Component 3 is a Single-Pole Single-Throw(SPST) switch. It is a basic on or off switch, just like the switch you use everyday to turn the light on in a room in your house. It has just a single blade that connects between the input and output of the switch to complete the circuit and allows current to flow. T6C09Â What is component 4 in figure T2? Component 4 is a Transformer. The symbol looks like two inductors, or coils, with an inductor in between. T6C06Â What is component 6 in figure T2? Component 6 is a Capacitor. A capacitor is used to temporarily store energy in a circuit. A capacitor is also used in an AC/DC converter to smooth out the voltage in the rectifier bridge so that it is a steady voltage that a DC circuit sometimes needs to operate correctly. T6C07Â What is component 8 in figure T2? Component 8 is a Light Emitting Diode(LED). Much like a lamp, when an LED gets the right amount of voltage to it, it lights up. LEDs can be used as indicator lights or even headlights now. T6C08Â What is component 9 in figure T2? Component 9 is a Variable Resistor, also known as a potentiometer. These are used in things like a volume knob on your radio or a dimmer switch for your interior lights on your car. T6D04Â Which of the following can be used to display signal strength on a numeric scale? A meter can be used to display your signal strength on a numeric scale, much like the speedometer on your car displays your speed. T6D02Â What best describes a relay? A relay is a switch that is electrically operated. Many relays use a electromagnet to operate them. Relays can control a very high voltage source with just a little bit voltage on the control input. One of the things that I use relays for is to automatically switch to a back up battery on our club repeater. The AC power coming in to power the radio, keeps the relay closed to allow the AC power to go through it. If the AC power goes out, the electromagnet de-energized and the relay switches to the other pole of it that has a battery connected to it. T6D05Â What type of circuit controls the amount of voltage from a power supply? A regulator is used to control, or regulate, the amount of voltage that is coming from a power supply. T6D06Â What component is commonly used to change 120V AC house current to a lower AC voltage for other uses? A transformer is used to lower or raise the AC voltage. Probably the most commonly know transformer is those big grey cylinder things that are hanging from the side of the electric pole before the wire comes into your house. The voltage that runs in the wires along the switch can be several times as much as what comes into your house. T6D09Â What is the name of a device that combines several semiconductors and other components into one package? Electronics were a lot different back 20-30 years ago than they are now, thanks in part to little things called Integrated Circuits. Circuits that use to be large in size can now be the size thumbnail. If any of you remember the first generation Gameboys by Nintendo, they had more computing power than the computers that was at mission control when Neil Armstrong took the first steps on the moon. Those computers were huge and took up a large room at NASA! T5B09Â What is the approximate amount of change, measured in decibels (dB), of a power increase from 5 watts to 10 watts? The power that you transmit doubles with every 3dB. So if you go from 5 watts to 10 watts, you double your power so you have a 3 dB gain. T5B10 What is the approximate amount of change, measured in decibels (dB), of a power decrease from 12 watts to 3 watts? In this case, we are going down in strength so it will be a negative dB or a dB loss. If you remember that your signal doubles or halves with every 3 dB it only takes a little math to figure out the answer to this. T5B11Â What is the approximate amount of change, measured in decibels (dB), of a power increase from 20 watts to 200 watts? Decibels(dB) is a very important part of amateur radio, especially when it comes to antennas. In this question, we see, after a little in your head math, that 200 watts it 10 times larger than 20 watts. If we just use the doubles every 3 dB you would have 160 watts at 9 dB and 320 watts at 12 dB so there really is only one choice that it could be and that is 10 dB. However, if you remember this table you can do quite a bit with easy math. T6B07Â What does the abbreviation LED stand for? LED stands for Light Emitting Diode. LEDs are much better to use as indicator lights than lights bulbs are because they take very little voltage and lasts a VERY long time before they burn out. T6D07Â Which of the following is commonly used as a visual indicator? T5B02Â What is another way to specify a radio signal frequency of 1,500,000 hertz? The beauty of the metric system is how easy it is to change to a different unit of measurement. Each major units takes 1000 of the previous major unit to make 1. That made more sense in my head. Let me elaborate. It takes 1000 hertz to make 1 kilohertz, it takes 1000 kilohertz to make 1 megahertz, and so on. T5B13Â If a frequency readout shows a reading of 2425 MHz, what frequency is that in GHz? Going from MHz to GHz you need to move the decimal point three places to the left. 2425 MHz would become 2.425 GHz. T5B03Â How many volts are equal to one kilovolt? One Thousand Volts = 1 Kilovolt. It doesnâ€™t matter the unit of measure that you are using it still all works the same way. 1000 Hz = 1 kHz. 1000 amps = 1 kilo amp. 1000 Ohms = 1 Kilo Ohm. T5B06Â If an ammeter calibrated in amperes is used to measure a 3000-milliampere current, what reading would it show? To go from Milliampere to amperes, move the decimal point to the left three times and you end up with 3 amperes. T5B12Â Which of the following frequencies is equal to 28,400 kHz? T5B05Â Which of the following is equivalent to 500 milliwatts? Going from milliwatts to watts you have to move the decimal point to the left three times, so 500 milliwatts because 0.5 watts. T5B01Â How many milliamperes is 1.5 amperes? In order to go from amperres to milliamperes you have to move the decimal point to the right three times, so 1.5 amperes becomes 1,500 milliamperes. T5B08Â How many microfarads are 1,000,000 picofarads? We are going two major steps between picofarads and microfarads so instead of just 3 spots, we have to go 6. So if you move the decimal point 6 times to the left, 1,000,000 picofarads become 1 microfarad. T5B04Â How many volts are equal to one microvolt? To go from a volt to a microvolt you have to move the decimal place to the right 6 times. So 1 volt becomes 0.000001 of a volt. It is just like count up, 1-10-100-1000-10000-etc but you just have to read it backwards. T7D08Â Which of the following types of solder is best for radio and electronic use? You always want to use Rosin-core solder when soldering because it is designed to melt at the lowest possible temperature. This is especially essential when soldering on surface mount circuits. T7D09Â What is the characteristic appearance of a cold solder joint? If, while looking at a circuit, you see a piece of solder that appears grainy or dull, you have a cold solder joint. A solder joint should have a shiny look to it. If you have a cold solder joint on your circuit board or whatever you are building, you will have issues with current and voltage making it past it. T7D07Â Which of the following measurements are commonly made using a multimeter? For the average user, a multimeter will generally measure Voltage, resistance and current. There is also sometimes a place to test diodes. The higher the price you pay for a multimeter, the more functions you generally will get. T7D11Â Which of the following precautions should be taken when measuring circuit resistance with an ohmmeter? In order to test the resistance of you circuit, you need to measure it with the power turn off or disconnected from it. If you try to measure resistance on a powered circuit, you will probably fry your ohm meter or the Ohm section of your multimeter. T7D06Â Which of the following might damage a multimeter? If you are trying to measure something in an incorrect setting, you can damage your meter. For example, Attempting to measure voltage when using the resistance setting can damage your meter. T7D10Â What is probably happening when an ohmmeter, connected across an unpowered circuit, initially indicates a low resistance and then shows increasing resistance with time? If, when testing with an ohmmeter, you initially get a low resistance the slowly increasing resistance with time, your circuit probably contains a large capacitor. The capacitor will actually start charging up from your ohmmeter and the resistance will go from an almost short circuit to having a resistance. So that brings us to the end of this section. Next week we will be talking about Emergencies! Please share my blog with your friends and if you have not done so already, pleaseÂ subscribeÂ to my email list to get an email when I publish a new post. Please Like me on Facebook, and follow me on Twitter, Google+, LinkedIn and StumbledUpon. Links to all of these can be found under social on the menu. Thanks for stopping by. If you have any questions or comments about today’s post, please leave them in the comments below.